Figure 1. Photo of the Ontario Military Hospital at Cobourg c. 1920. Many returned veterans, including Dennis R., were treated for war neuroses at this hospital between 1916-1920. Cobourg Public Library, 610-2. Dennis R. enlisted with the 244th Battalion of the Canadian Expeditionary Force in July 1916. In May of 1917, he proceeded to France and was transferred to the 23rd Battalion. When his mental symptoms began, Dennis could give no account of himself, had headaches, was pale, feverish, nervous and shaky. His symptoms fit well within the scope of what was at the time called “shell shock,” which was characterized chiefly by being easily startled, and suffering from headaches, sleeplessness, nightmares, tremors, and loss of appetite. [vi] Although he was confused, medical officers attributed Dennis’ illness to prolonged exposure to shell fire and the shock of a nearby lightning strike during a thunderstorm. Dennis was evacuated to England, passing through the Lord Derby War Hospital at Warrington and the Royal Victoria Hospital at Netley, before being sent back to Canada in October 1917. Figure 2. 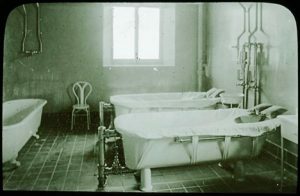 Photograph of the continuous baths at the Ontario Military Hospital. Veterans, like Dennis R., were treated primarily with rest therapy, which included hydrotherapeutic baths. Library and Archives of Canada, 1974-258 NPC. Dennis was discharged from the military and the OMH in 1918. Even though the medical board at Halifax had determined he had suffered from a 75% disability attributable to service, the Board of Pension Commissioners (BPC) rejected his first pension application. After treatment in hospital, his symptoms had alleviated, and pensions were only awarded for permanent loss of ability. [xi] What would happen if Dennis’ symptoms relapsed after the war? This initial pension application denial represented the beginning of Dennis’ struggle to have his illness recognized as war trauma. A decade later, in 1928 at the age of 31, Dennis went to the Soldiers’ Civil Re-establishment Clinic in Montreal, complaining of weakness, falling asleep at work, and pain in his head. He wanted treatment and to re-apply for a pension. 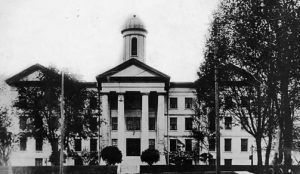 After observation at St. Anne de Bellevue mental hospital, Dr. Myers, the resident Senior Medical Officer changed Dennis’ diagnosis to “constitutional psychopathic inferiority”, a vague diagnosis that implied inherited mental degeneracy. Dr. Clarence Farrar, the chief psychiatrist for the Military Hospitals Commission of Canada, believed that up to 90% of the shock cases treated at the OMH were the result of individual biological predisposition, which would absolve the BPC of responsibility in these cases. [xii] The BPC had also acquired a letter from one of Dennis’ superiors in the 23rd Battalion––Captain Philip Walker––who stated that Dennis was not subjected to exceptional exposure on active duty. It is clear that the BPC weighted Captain Walker’s testimony heavier than Dennis’. The BPC assured veterans that their evaluations and ratings of disability due to war service were “both accurate and fair”. [xiv] Veterans, however, did not always agree. Their pension files highlight that a change in diagnosis to an inherited mental condition had significant ramifications for their applications. Dennis’ “constitutional psychopathic inferiority” was considered a congenital condition that was not eligible for a pension because inheritance could not be attributed to military service during the war. The stigma associated with mental illnesses was so great that during his hospitalization in 1917, Dennis himself resented being treated in the same hospital as one of the “mentally defectives”. How he felt being treated among them, when his diagnosis was changed after the war, is uncertain; he had no further communication with the BPC, which did not keep track of veterans after they were denied pensions. Dennis’ case history reveals the path by which his “shell shock” was changed to “constitutional psychopathic inferiority.” In this way, Dennis’ suffering was not pensionable when the BPC denied him further treatment and a pension in the post-war period. Kandace Bogaert is an AMS History of Medicine post-doctoral fellow at the Laurier Centre for Military Strategic and Disarmament Studies. Her current research focuses on the tensions between authoritative medical knowledge and First World War veterans’ perspectives and experiences with neuro-psychiatric illness. The research for this blog post was conducted at the Laurier Centre for Military Strategic and Disarmament Studies (LCMSDS) in Waterloo, ON, which was made possible by the generous funding of the Social Sciences and Humanities Research Council (SSHRC). Follow the LCMSDS on Twitter or “Like” its Facebook page. You can also visit canadianmilitaryhistory.ca for more details about the Centre’s work. [i] Mark Osborne Humphries, “War’s Long Shadow: Masculinity, Medicine, and the Gendered Politics of Trauma, 1914–1939,” The Canadian Historical Review. vol. 91, no. 3 (2010) pp. 503–531; Mark Osborne Humphries, Kellen Kurchinski, “Rest , Relax and Get Well? : A Re-Conceptualisation of Great War Shell Shock Treatment,” War and Society. vol. 27, no. 2 (2008) pp. 89–110. [ii] Terry Copp, Mark Osborne Humphries, Combat Stress in the 20th Century: The Commonwealth Perspective (Winnipeg: Canadian Defence Academy Press, 2010); Colin Russel, “The management of psycho-neuroses in the Canadian army.,” The Journal of Abnormal Psychology. vol. 14, no. 1–2 (1919) pp. 27; T. Salmon, “The Care and Treatment of Mental Diseases and War Neuroses: (‘Shell Shock’) in the British Army,” War Work Committee of the National Committee for Mental Hygiene (1917); John C. Weaver, Sorrows of a Century: Interpreting Suicide in New Zealand, 1900-2000 (Montreal & Kingston: McGill-Queen’s University Press, 2013): p. 160. [iii] Library and Archives of Canada, File ‘Ontario Military Hospital, Cobourg’ RG 9 II-L-1, Volume 8; Library and Archives Canada, Attestation Paper, R., Dennis, RG 150, Accession 1992-93/166, Box 8575 – 18; Laurier Centre for Military Strategic and Disarmament Studies Archives, Veterans Affairs Canada Pension Files, R., Dennis, Reel 268, p. 47. [iv] Les Perreaux, “Surge of Afghanistan veterans to test Canadian mental-health care resources,” The Globe and Mail (2016). [v] Les Perreaux, Laura Stone, “Ottawa lacks urgency dealing with suicide crisis: veterans advocate,” The Globe and Mail (2016); Ashley Terry, “Invisible Wounds: Crisis in the Military,” Global News (2016). Not everyone agrees with this interpretation of PTSD/suicide in the military. For a counter-perspective, see: Colby Cosh, “The PTSD crisis isn’t a crisis, and inventing one doesn’t help,” National Post. (2016). [vi] C.F. Tisdall, “Shell Shock,” The Public Health Journal. vol. 10, no. 1 (1919) pp. 6–12. [vii] A. Ross Diefendorf, Clinical Phsychiatry: A Text Book for Students and Physicians, Abstracted and Adapted from the Seventh German Edition of Kraepelin’s “Lerhbuch der Psychiatrie” (New York: The MacMillan Company, 1912). [viii] Clarence B. Farrar, “War and Neurosis: With Some Observations of the Canadian Expeditionary Force,” American Journal of Psychiatry. vol. 73, no. 4 (1917) pp. 693–719. [ix] H. Dover, “Medical Board Work on Psychiatric Cases,” Canadian Medical Association Journal. vol. 10, no. 6 (1920) pp. 543–7. [xi] J. Biggar, “The Pensionability of the Disabled Soldier,” Canadian Medical Association Journal. vol. 9, no. 1 (1919) pp. 28–33. [xii] Clarence B. Farrar, “War and Neurosis: With Some Observations of the Canadian Expeditionary Force,” American Journal of Psychiatry. vol. 73, no. 4 (1917) pp. 693–719. [xiii] The Department of Soldiers’ Civil Re-establishment, Returned Soldiers Handbook (London: St. Clements Press, n.d.).